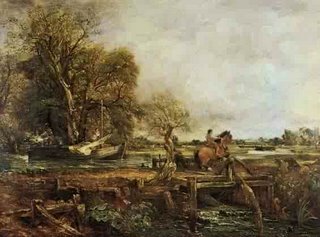 These are the two versions of John Constable's Leaping Horse. If you click on each image, it will blow up for you. In real life the colors are more similar, but these are photos from different places on the internet. 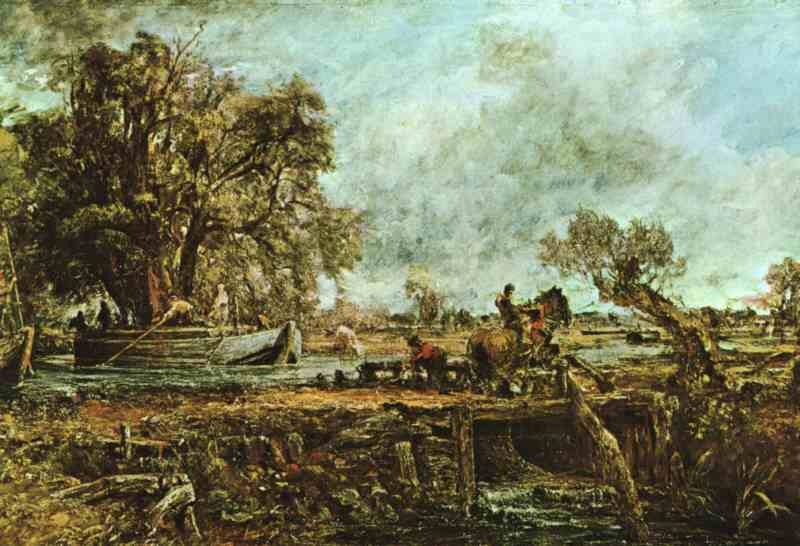 The first photo shows a rough look with rough looking clouds and tree branches, big swaths of color with little small detail, like an impressionist painting. In fact the idea is very similar to an impressionist painting. The second photo is much more specific and detailed, including tree branches, clouds, field in the distance, etc. Both versions hang in major museums around the world, just never together. Usually it's the finished paintings you see in catalogues and books. The exhibition will be in LA next summer at the Huntington which owns one of the pictures. I read that Robert McFerrin, Bobby McFerrin's father, has died. In my mind he is remembered for a glorious performance of Mendelssohn's Elijah in Sacramento. The great arias for baritone, "Lord God Of Abraham, Isaac, And Israel" and "It Is Enough! O Lord, Now Take Away My Life", are in my mind in his voice. He had a beautiful baritone voice and a great soul. There is a tour of paintings by Constable that is currently in the National Gallery of Art in Washington. All of his giant paintings are there. 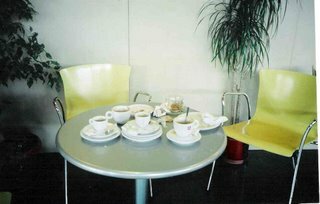 Most of them come in two versions: one painted quickly at the location and one painted slowly in the studio. The quick paintings look like impressionism. They practically all have the same layout: big trees on the left, fields on the right, details in the middle. He painted tiny pictures, too, and some are on display. 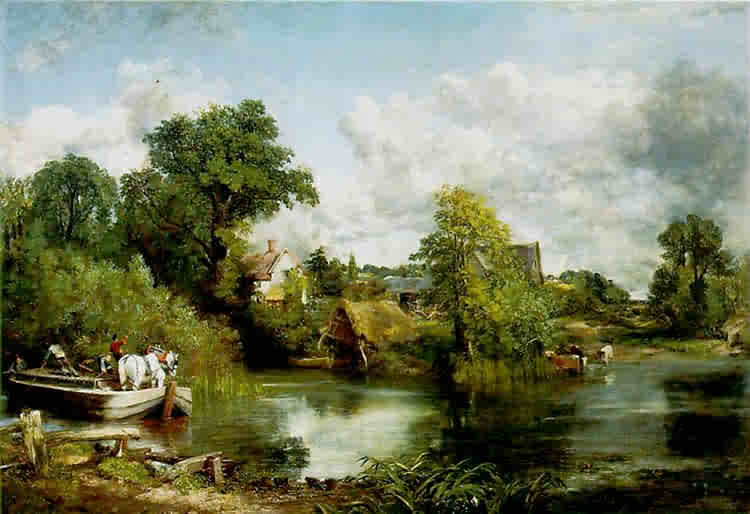 He is considered the best English landscape painter. Gelb and Levine announce for an end to "stand and sing" opera staging here. It's about time. The buzz on the Cecilia Bartoli forum concerns a tenor named Celso Albelo. He has recordings on YouTube if you want to hear him here. He sounds interesting in the Italian style, I would say. His color is very bright and rich at the same time. Sort of in the Rubini tradition. I think of opera as show business, and no one is bringing more show business to opera. Anna makes me smile. One loves it that she holds nothing back. In this she is completely gone mad. It doesn't make you think of Carol Vaness, does it? While driving to Ohio, I went into a cafe to drink some coffee, and there on the screen was OJ Simpson. There were films of him sitting in restaurants and on the street. I don't know about you, but I don't want to look at OJ Simpson. Apparently the show has been pulled. It did make me think, if OJ, why not me? 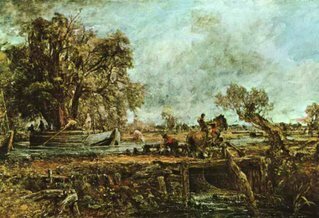 I should hire someone to film me waiting for the bus, walking around DC, looking at art--there is a wonderful show on Constable at the National Gallery of Art--riding the train to NYC, etc. Then I could podcast it over the internet. No? I was also imagining creating an internet radio station. Classical music on the radio is always attempting to imitate musak. I think it would be possible to make it more interesting. My radio station would be all singing all the time. I fantasized a Strauss Four Last Songs marathon with performances by one singer after another, good and bad. I could solicit performances from readers and sprinkle them in between the standard recordings. I would talk in my Oklahoma accent between the recordings, perhaps in a podcast version. There could be an unidentified "Casta diva" series, you guess who is singing and win a prize. We could have a crossover [or cr***o**r, as Gert says) day where we pick the most excruciating recording of opera singers singing pop. Nowadays this would need to include pop singers trying to do classical. Sting as Dowland comes to mind. Then I told my ideas to Chris and he reminded me of problems with owned material. He is my conscience, my Cassandra. He did think the idea would work better with video. Now that I think about it, it sounds a little too interesting. I did not expect that blogging would lead to corresponding with Philip Gossett. I had no preconceived ideas at all. Although I must say he has inspired me to be even nerdier than I would normally be. I am overdue for some silly writing. I did not expect the reception I have received about my other blog, the crime novel, perhaps enough silly writing to last a lifetime. I posted it to achieve distance from it, something that has been achieved. Other people reading it recognize in me a notorious stalker, someone seen in abnormal places for abnormal but very common reasons. They send me things, amusing things I am forbidden to blog. I'm getting used to it. I did not expect to still be living in Maryland. "Did you have anything to do with Cecilia's Rossini Heroines album besides writing the line notes? It's one of the great things." "It happened so long ago (1990-92) that I had to go back and check my notes. But, yes indeed, I suggested the repertory for her (many of the pieces she had never sung before). That was the second disc I did repertory suggestions for her: the first was her disc of Rossini songs (the one that also has "Giovanna d'Arco" on it). Most of those songs were simply unavailable in modern editions. (By the way, we are now--finally--editing the volume of songs for the new Baerenreiter continuation of the Rossini edition, so we hope that the volume will be out in 2009. And it will have some unknown material!!!) For the "Rossini heroines" disc, then, I did indeed suggest the Colbran arias that she did (I suggested more than she ultimately chose, of course) and even prepared some of the ornamentation for her to use (which, of course, she adapted for herself--was is right and proper). "Would she had continued to do Rossini, but her interests have largely pushed her back to the eighteenth century. She remains superb!" "She is following her bliss." This Ermione from HofO appears to be a different one from what's advertised. Instead of Blake, we have Gonzalez, and Marilyn Horne is not in it. This opera is a tenor feast with duets between Merritt and Gonzalez. Would it be interesting to know a lot about Rossini? What was it I loved about Cecilia Bartoli? I always think that her brain runs so much faster than mine, like a slow motion camera that catches every detail about each note, how it begins and ends, precisely where it lies in the phrase. I have never heard such precise phrasing from anyone, not even the magnificent Marilyn. There's just so much there to hear. I love a person who can stimulate my brain. After listening to all this Rossini, does Cecilia's Rossini Heroines still stand up? Every note is like three of someone else. There is joy in these completely precise, completely expressive outpourings. Her rubato is the best ever. Yes, rubato in Rossini. No one else comes close. Still, after all these years, I have never loved a singer this much. After reading Divas and Scholars, I became interested in the career of Marilyn Horne, cited often in the book with great admiration, particularly in any discussion of Rossini. Curiosity led me to order three operas from House of Opera: Tancredi, Ermione and Bianca e Falliero. It took until this week for the disks to arrive from HofO, though I ordered them in mid September. Tancredi, 1813, already discussed above, is very different from Bianca e Falliero, 1819, though only 6 years stand between them. Or is it only Marilyn Horne who is different? As the voice ages, its cartilage hardens, and the flexibility changes. In Tancredi she reveals more lyrical flexibility, but in Bianca e Falliero she is excitingly dramatic while still awesome in the performance of coloratura. This is a good choice for seeing Horne in all her glory. HofO apologize for the quality of the reproduction, but the volume doesn’t constantly phase up and down the way the other one did, so I actually prefer it. Bianca comes from Italian television, and includes no subtitles. Or perhaps it is also the roles that are different. Tancredi is very somber and tragic while Falliero is powerful and dynamic. Chris Merritt is here, singing Bianca’s father who wants to marry her off for money. Apparently in this period tenors played fathers. He has a big, meaty voice, almost the weight of a dramatic tenor, and not at all the Juan Diego Florez type of Rossini tenor. It is a joy to hear his easy, beautiful high notes and graceful, almost matter of fact coloratura. Like Horne, he is also in his prime. Katia Riccarelli is very glamorous. I’m not sure why, but I seem to like this better than Tancredi. This is what opera used to look like and in some places still does. They form themselves into tableaux and move only occasionally during an aria. I have been sent this very nice link about the arts on YouTube. I am hoping that the owners of these clips don't start an absurd attack on YouTube. This is a wonderful way to find out about opera. Someday I will have high speed internet and will get back to using it myself. I haven't said a lot about the Russian Album, because I feel inadequate. This is the first time I have wanted to play an album over and over since my infatuation with La Bartoli. I heard Anna Netrebko in recital in San Francisco with Donald Runnicles accompanying a few years ago (I read on the internet that this took place in May of 2004). I remember complaining that she should have been prevented from singing Strauss, since she obviously did not get it. I also remember that the second half was Russian songs--amazing Russian songs by Rachmaninov, one of which is on the album. I used to sing Russian songs occasionally, Mussorgsky, Rachmaninov, Tchaikovsky, though never actually in Russian I confess, but realize now that I was also in the category of not getting it. Who knew this was what it was supposed to be? I have agreed with her decision to emphasize Italian opera while wishing for Russian. Now that it is here, I can't get enough. My interest in teaching composers to write for opera singers was aroused by listening to the singers in Sophie’s Choice struggle with their parts. It was not too hard for them to sing, it was too easy. In fact, the composer probably composed it for himself to sing. I’m going to write only about composing an opera to be performed by an opera company made up of trained opera singers. I am making a possibly absurd assumption--that you are composing for the ages, that you want your opera to be performed in 10, 20 or maybe even 100 years. If you don’t really like to listen to opera singers, if that sound makes you cringe, then please don’t compose an opera. Please. Do a musical instead. If you are still reading, perhaps you still want to compose an opera. Print a large sign and hang it near your keyboard: “I am not an opera singer.” It doesn’t matter how it sounds when I sing it. Then move on to the list of Fachs. I’m printing an abbreviated list here, together with ranges and tessituras. The ranges are from Wikipedia, but I made up the tessitura for each Fach, so feel free to criticize. Within each big category based on range, lyric and dramatic specialties will be based on sound. Range: From middle C to the F two-and-a-half octaves above middle C.
This Fach divides into lyric and dramatic coloratura, but the ranges are the same. The tessitura is E above middle C to high C. The other notes are extensions. Range: From middle C to the C two octaves above middle C.
This Fach divides into lyric and dramatic sopranos, The tessitura is E above middle C to G above the treble clef. The range of a dramatic soprano can go below middle C and the tessitura goes down to middle C. The other notes are extensions. This Fach divides into mezzo and contralto. The tessitura is middle C to F at the top of the treble clef. The other notes are extensions. Contralto roles will extend down to F.
Theoretically the same as a contralto. Britten wrote for a countertenor in A Midsummer Night’s Dream, and you can too if you want. Traditionally these are roles that were written for castrated men who had voices that were similar to the female voices described above, except I am not aware of a castrato who achieved the true coloratura range. Today they are normal men singing falsetto. I suggest selecting a specific singer to compose for this. Range: From the B below low C to the C an octave above middle C (C to c'). This Fach also divides into lyric and dramatic, and the tessitura is E to G. A high C is a much bigger deal for a modern tenor who is forbidden to go into falsetto than it is for a soprano. Don’t think of them as exactly an octave apart. If you want a lot of very high notes, compose for a Rossini tenor, if you can find one. There are buffo, lyric and dramatic baritones, and the tessitura low C to E.
Range: From the E one-and-a-half octaves below middle C to the F above middle C (E to f'). The tessitura is A to E.
Go to your list of characters, and put each one into one of these classifications. Decide if the sentiments of the character are mainly lyric or dramatic. Compose most of the notes within the tessitura, but place the notes all over. Write up and down in the voice. When you want a heavy dramatic effect, write a note in the upper extension, but clearly distinguish how high to make it based on Fach. A mezzo will begin to sound dramatic at a lower pitch than a soprano. Emphasize the upper part of the tessitura for sopranos and tenors. Put in low notes for mezzos, baritones and basses. Be sure the singer gets to use all of their voice, possibly omitting only some of the highest extensions, since this will make the role easier for them to sing. This will make the role easier to sing. They are trained to use all of their voices, so you should, too. I won’t say what the specific style should be. Pointillism, singing with a lot of giant leaps, popular with the Second Viennese school, is not hard to sing if you know what you’re doing and the notes obey the outlines shown above. Compose whatever you want, but don’t just stick to the five little notes you can sing. If you have particular singers you want to compose for, by all means do. Begin by asking them which Fach they belong to, and then look it up. If they don’t know, reconsider using them. Don’t compose an opera for Sting. Traditionally certain Fachs play certain types. The heroine is a soprano, the hero a tenor and the villain a baritone. If you are composing for specific singers, you may want to rearrange the traditional setup and make the heroine a mezzo, for instance. By all means do. The Ghosts of Versailles is a modern opera that is very well written for singers. Britten had a lyric tenor who lived in, so his operas all feature a lyric tenor. This lyric tenor knew what made his voice sound good and made sure the roles suited it. Your job is to make the singers sound good. Modern composers are able to imagine a high lyric soprano like Dawn Upshaw and seem to compose everything for them. Try to branch out. Learn to like fatter voices, too. Please. I have kept this very basic because that’s how bad it is. Of course, I cannot tell where my copy of the Russian Album came from. The music is entirely unfamiliar to me except for Tatiana's scena from Eugene Onegin. It does make one curious. Where has all this gorgeous music been hiding? Advice to Deutsche Grammophon: release track 2 in the US as a pop single ahead of the album and see what happens. I think Anna would be well advised to start a vogue for the vocal music of Rachmaninov, known for the All Night Vigil and piano concertos. He was a wonderful composer for singers, too. But then, maybe Russian will become the new Italian. Anything is possible. My copy of Paul Barker's Composing for Voice has arrived. He is obviously knowledgable, but his ideas are not well developed. In fact, he has a hard time carrying an idea past one or two sentences before going on to the next one. There is an idea that interests me--should a composer write for a specific singer? The answer, it would appear, is yes and no. Philip Gossett's four composers (Rossini, Bellini, Donizetti and Verdi) didn't hesitate to compose for a specific singer and modify their music to suit the person currently filling the role. In situations where the singer is close to the standard range and tessitura for his Fach (classification--look it up in Wikipedia), this is not a problem. They were thinking about success this week, certainly not further out than this year, and not about posterity. They weren't thinking about twenty-first century productions and problems of casting. So when Bellini composed for Rubini he wasn't thinking about the fact that Rubini was a one off. No one else can actually be Rubini. Nor do they want to. Falsetto high notes have long been completely out of style. Bellini's presence in the repertoire is negatively impacted by the fact that the tenor started out with this freakish high range which cannot be cast today. Professor Gossett went into detail about the problems of transposing this music so that it still works in duets with the soprano. Very difficult. Barker recommends working with specific singers and includes interview material with singers who have collaborated with composers. This is great stuff and the comments are excellent. But I was hoping for more material about expectations. He shows ranges for the Fachs and mentions the concept of tessitura, but that's it. I was hoping for more specific information about what the standard tessitura generally is. That means the range where 90% of the notes should lie, the comfortable part of the voice for that Fach. This singer you are working with--is she (all his examples are women) fully representative of her category or is she a bit freakish? It seems to me you should be able to say for each Fach these are the notes they will usually sing and these are the extensions, the outer extremes that can be used occasionally. Yes, write for a specific singer, but try to be aware of how close this one is to the ideal for her type. Then the music will work for other people, too. I have been imagining myself in Paul Barker’s class. I was always a very annoying student. He would say, “the trend may be seen as a logical continuation of a process engendered by Verdi’s Macbeth (1847), when he attempted to notate a fuller dramatic conception of the vocal performance.” Then he would immediately go on to another subject with no explanation, as he always seems to do, and I would say, “Excuse me, professor. I’ve never looked at the score to Macbeth. What the hell are you talking about?” This is perhaps my crotchety old lady persona, and I wouldn’t actually have sworn at him. However, I don’t have a library handy that has a score to Macbeth so I guess I’ll never know what is meant here. I wouldn’t mind this so much if he didn’t do it so often. If you’re writing a book like this, I recommend hiring an ignorant editor that makes you explain everything. Just how bad the situation is with regard to composing for singers can be seen when he says, “…I have never encountered a summary of the traditions and details about the underlay of text in scores….” He goes on to lay them out, and his explanation seems acceptable. He mentions how hard it can be to read vocal music because of the way the text is added to the music. He writes from the perspective of the twentieth century where everything is precisely composed, and the performer is expected to precisely reproduce the written page. This is actually not the tradition of solo vocal music where the performer is expected to produce an interpretation, not just a performance. Perhaps awareness of this fact is disappearing everywhere except pop. He discusses extended vocal techniques, things outside of normal vocalization, and cites a number of people who do them but without any description. He does explain the concept of vocal harmonics first propounded by Stockhausen. He says it can take up to 6 months to teach a singer how to do this. Clearly he’s going off in directions I don’t necessarily want to follow. I don’t see a reason to mention these things without either discussing them more thoroughly or citing relevant footnotes. There is a two page bibliography which might provide a wider explanation of some of these facts, but you’d have to read them all to find out. There is quite a lot of writing about the relationship between text and music. He criticizes singers for making their vowels unintelligible on high notes with no apparent awareness that once the voice is above the formants, distinguishing vowels is simply not possible. There are a couple of excellent charts, including this continuum: noise - shouting - speaking - sprechgesang - crooning - recitative - singing - prolonged melisma - vocalize. This is virtually a circle. Another excellent chart is the one in the chapter on “Considerations of Style” called “Variants of vocal style and the effects on singers.” On the vertical axis are 1. 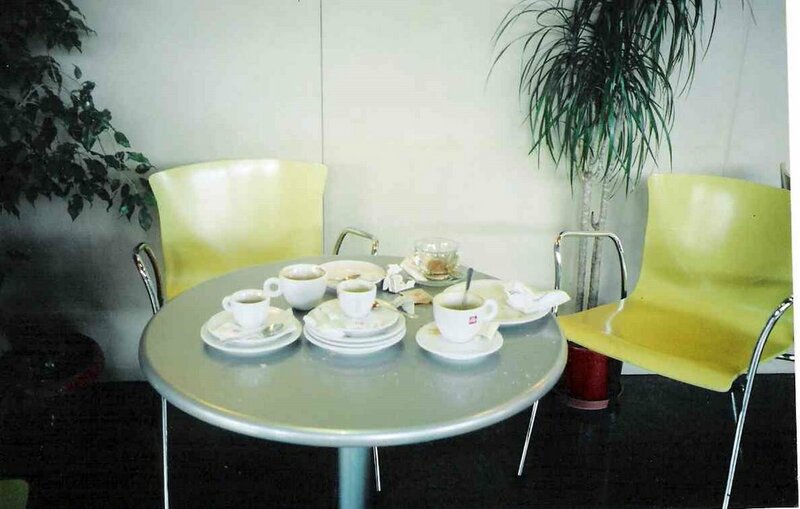 Registers, 2. Tone, 3. Words, 4. Rhythm, 5. Proximity (this means the distance from the audience to the performer and extends from immediate closeness to amphitheater distance.) The horizontal axis is “Underdeveloped technique,” “Bel canto principles,” “Over-refined technique.” He then places a number of specific composers in the continuum. Britten is C, bel canto, in all categories. Does this explain the popularity of Britten as an opera composer? This chart could be discussed at great length. Composing for the voice is a much broader topic than the narrower composing opera. An opera presumes opera singers, presumably the same people who will be singing Puccini on other days. My own approach would probably be to proceed from the perspective of style. I admit the possibility of all manner of style elements and approaches, but I insist the composer must first choose. Jumping from style to style would be discouraged. He discusses the growth of the orchestra over the course of the nineteenth century and its effect on singers. It’s not exactly a bad book. It’s as though the light has been turned on, but the exposed space has not been sufficiently explored. A set of appropriate footnotes would probably be as big as the book itself which is about the same size as the dual language edition of Odes to Common Things by Neruda. It’s definitely not worth $95. La Cieca is about the only one still blogging. Everyone else seems to have a life. I have decided to move from Maryland whether my house sells or not. Perhaps then I can begin to have a life, too. Here is an interesting thing--a list of arias from operas by Benjamin Britten, who is by far the most popular English opera composer, maybe even the most popular opera composer after World War II. I have always liked A Midsummer Night's Dream and Death in Venice, but the concept of aria isn't exactly the same as in bel canto. Paul will not be converted. While we are on the subject of Brahms, Opera News ran an editorial praising Pizzazz in recitals. Yes. By all means. Cecilia Bartoli has had a marvelously lucrative career based on her unrivaled pizzazz in the recital and concert format. My problem was that they cited as the most boring recital they could think of an all Brahms program. So Brahms can't have pizzazz? I used to do a lot of Brahms which may explain the complete dud of my performing career. The lack of pizzazz in recitals can be credited to the academic influence. Degree programs frequently have recital requirements, and academic vocal recitals follow a certain format and have certain expectations. This philosophy of programming has found its way into Carnegie Hall where we are supposed to be impressed by obscurity while pining away for hit tunes. Classical music works too hard to distinguish itself from pop. Make pop out of classical. Don't wait till the encores to do what you do best. I was riding to the gym in my car, listening to NPR, when a voice came on to announce the death of William Styron and to discuss his life and career. Playing in the background was Marian Anderson's performace of the Brahms Alto Rhapsody, one of the great performances ever of a piece I love very much. The piece is a perfect pairing of two things I love: Brahms and Goethe.